Emoticons are small graphic pictures or icons that attempt to depict a person’s moods or feelings. They are a fairly recent feature of Facebook; but they have been around far longer in chat software like Yahoo! Messenger and other instant messenger services. Facebook first made the emoticons available in the chat feature. 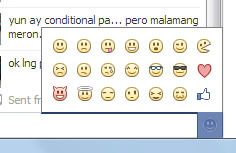 There are two ways to add emoticons while using the Facebook Chat feature. The first method is by using the menu that Facebook itself has conveniently made available. When you click on a friend’s name to bring up a Chat window, find this small round icon at the bottom right hand corner of the window. Clicking the icon will bring up another window with a choice of icons for you to choose from. Click on the icon of your choice. The text code for it will appear in the box where your message is initially typed. You can type in additional text if you wish. When you hit the Enter key, the icon appears inside the Chat window. The second method is simply to type in the text code into the form box of the Chat Window. Recently, Facebook has also made this feature not only for Chat but also for Comments and Personal Messages.